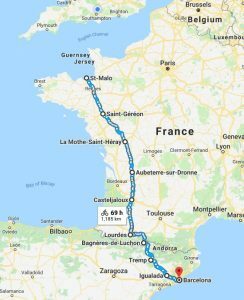 In 2019 our continental riders will be leaving from Portsmouth on the evening of Thursday September 5th, covering 1,200km for 9 days, arriving at Barcelona on Saturday September 14th. As always, riders will be fully supported by our volunteers, with vehicles to carry their luggage and provide food stops during the day, allowing them to focus on their riding. They have to cover their own travel and accommodation costs, plus try to raise as much sponsorship as they can.